I am not sure if I have used this picture before, but I am sure I have considered it dozens of times, because it fits with so much of what I write. 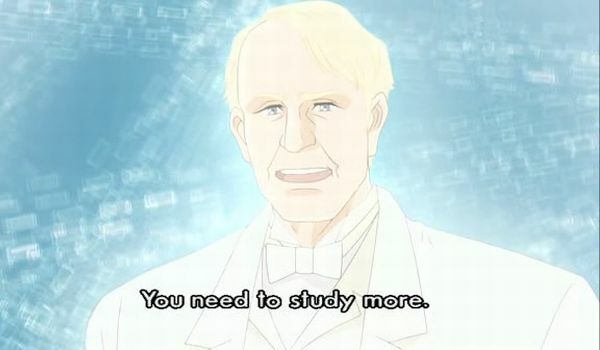 And then in the meaning “I have to study more”. When I was little, I loved to learn random things. I grew up in a home filled with books and papers and magazines, and have three older brothers, so I learned to read long before my first school day. I remember withdrawing to the attic with a book often. The place was just used to store things, it was not really finished, but for me it was a special place. Â If I remember correctly, I called it “klokingshulen”, a Norwegian pun meaning either “the sage’s cave” or the “the cave of the process of becoming wise”. I cannot remember if I came up with this name or one of my brothers, we were all a creative little bunch. But I remember spending time there alone with textbooks and such. Knowledge is not wisdom, but it is a good start. Â Before you can cook a meal, you need to have ingredients. Â And before you can think deeply, you need to have something to think about! I am glad I loved reading, and looking at things, and using my imagination. Â When I had read something new, I would afterwards use my imagination and create stories where these things appeared. In grade school we learned by heart the multiplication table, but soon I understood that multiplication was just repeated addition. It is still kind of awesome to live in a world where two times three gives the same result as three times two, but it is kind of logical if you can count. Â I suppose all healthy kids understand this pretty quickly. In the same way, we find patterns in other things as well. This is what I call understanding. Â It goes beyond rote learning and provides a sort of shortcut in thinking. Â Without learning, we would not find those patterns in things and be able to go forth and multiply our knowledge, so to speak, taking it to a higher order. Somewhere, sometime, someone must have pondered the relationship between addition and multiplication. And they must have realized that if you could just repeat addition and get multiplication, then you would get something if you repeated multiplication as well. Â I don’t know who first thought of it, but already the ancient Egyptians realized that if 3 and 9 were holy numbers, then 27 must be too, and 81 must be really holy. Â So someone there was at least dimly aware of the power of “powers”. Today, computers are based on the powers of 2 – binary – and our common way of writing numbers is based on the powers of 10. Wisdom is kind of like that. You take understanding one step higher, and then you find some way to make it useful. Â Well, that is one way of looking at it at least. Wisdom is not just being able to learn, and being able to generalize from what you learn, but it is finding what is really important in what you have learned and understood, and applying that to your life. Â Or at least that is part of it. Anyway, you can kind of learn wisdom from others, by reading books of wisdom etc. Â But you cannot just jump to that. You have to have knowledge and understanding first. Â You cannot cook without ingredients or build without materials. Â Also, I am not sure, but I think you need some hands-on experience of wisdom in order to “get it” when you see it elsewhere. Â Still, you can definitely learn wisdom from others. And you should, because life is short. If you enjoyed learning facts and loved understanding things, if flashes of insight gave you a thrill, then recognizing words of wisdom is likely to fill you with a bliss so overwhelming that it is hard to describe. Sometimes I can hardly contain my joy when finding another piece of the puzzle, opening up another part of the larger picture. And it is good that I feel this joy, because the book may taste like honey when I eat it, but it burns in my stomach. Digesting wisdom – getting it embodied in my own flesh, so to speak – is the tough part. It usually comes at the expense of something else. I guess sometimes you have to bring out the butcher’s knife. But sometimes all I do is hold on, and the stupidity dies eventually. Â Looking at some of the fantasy books I carried this February on the icy, slippery path in the freezing wind, I remember looking at them afterwards and still thinking I would read them again Someday. Â But after months of reading a little wisdom most days of the week, the idea of going through those fantasy books again is like drinking from a puddle. Â I would have to be pretty desperate. There is a saying – I think I picked it up in the Christian Church – that “wisdom is none other than seeing the folly”. Â Certainly that is a big part of it. Â And first and foremost in our own lives. Â But then perhaps eventually we can help others solve their problems too. There certainly are enough problems in the world, and it seems to me that the vast majority of them come from thinking that is counter-productive. Â That is to say, people think thoughts that make it harder for them to live good, happy, satisfying lives. Â If only there was some way to reach them!